This post summarizes the candlestick back-testing so far. To understand the effectiveness / profitability of these signals, I choose to look at two measures of performance. If the number is small, the results are not statistically reliable. The back-tests were done on the SP500 symbols over the past 15 years. This is the third post in my three part series of backtesting a candlestick patterns. Earlier, I back-tested the Bullish Engulfing Pattern and the Hammer. Today, I will back test the Bullish Harami Pattern. In my blog post yesterday, I said that I will be back testing three candlestick patterns. 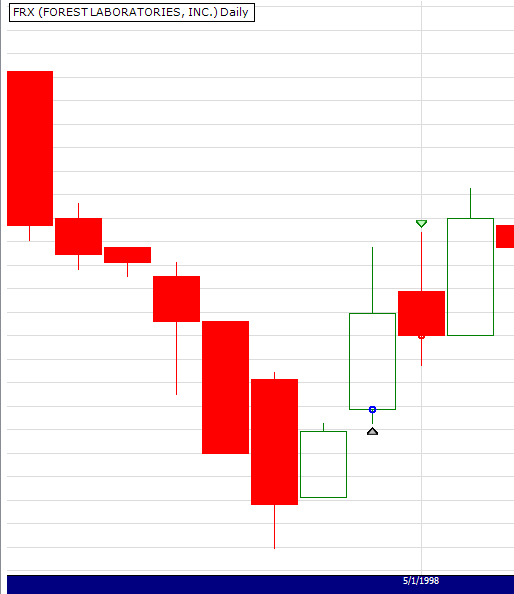 Today, it is the Bullish Engulfing Pattern. Do Candlestick Patterns Work ? Recently, I have been exposed to a lot of material on candlestick charts (Japanese Candlestick Charting Techniques, Candlestick Forum). I really like the intuitive look and feel of a candlestick charts. Conventional wisdom states that the doji is a trend reversal signal. It signals a 'draw' between the buyers and sellers. If a doji shows up at end of consecutive down days, it may mean that the down trend is coming to an end. The theory is impressive. The name of the signal is impressive. The back test results are NOT. And this leads me to question. Do candlestick patterns work? Recently, I blogged about Performance Metrics. My friend at Engineering Returns agrees with me. I am not sure if the author has ranked his KPIs in ascending order of importance. But if he did, his top three metrics match with my top three. The use of price action to make buy/sell is prevalent. According to many, price action is the fundamental thesis of practitioners of technical analysis. Technical Analysis is the art of following price action. Over the past few weeks, I have been thinking about how to measure the success/failure of my trading strategy. I wrote a post titled, What is a good strategy. I have also been looking what other people are doing with respect to performance metrics of a strategy. A portfolio that has a rate of return of 1% over 4 trading days has a CAGR of ~85%. Another portfolio that has a rate of return of 5% over 20 trading days also has a CAGR of ~85%. Gains of 1% over 4 days may be more achievable that gains of 5% of over a month. Another important metric is the Max Drawdown as a measure of risk to the portfolio. This is a measure of the difference between the highest value of the portfolio to the lowest value of the portfolio. A very high drawdown can make the strategy impractical as you may not the capital to execute the on the signals provided by the strategy.